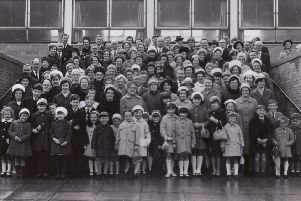 The 1st Kinglassie Women's Junior Air Corps line-up for inspection, June, 1974. EVERYONE likes looking at archive photographs and enjoying a good old wallow in nostalgia. And a growing trend among social networking site users is providing a valuable resource about our communites. A number of Facebook pages have been set-up and dedicated to specific areas locally, and one of the best-established is the ‘Kinglassie Past and Present’ site run by Gary Hopton. The site currently includes photographs of the village in its mining days and of its older heritage, including Inchdairnie House - burnt down in 1901 - which was the home of the landowning Ayrton family. There are also archive and contemporary newspaper reports, including many from the ‘Gazette’. Gary explains: “I had the idea last year as I have always been interested in the history of the village. “Dan Imrie made a great history book about the village in 1989 and I thought I could do an online version which villagers here, or ex-villagers throughout the world could also view and it could bring back memories. “Also the village has expanded recently with a lot of new houses at the east end and the site could let them see what Kinglassie used to be like in the past. “I also add stories from the present so people can keep up to date with what’s happening in recent times. “People seem to like it and it`s attracting views and comments from ex-villagers as far afield as Australia, Canada, and the United States. “I`m still on the lookout for old pictures of Kinglassie events and would be grateful if anyone could either e-mail me the,m or allow me to scan them for the site. They would gladly be returned and they can be dropped off at Kinglassie Post Office and if they leave their address I will return them.